I know this isn't the ideal location for the wastegate flange, but are there any real drawbacks? It would be great if the exhaust flow was a salmon...It would be better where all cylinders collect and go to the turbo , like by that number on the manifold...I would not what to worry about if it is bad or not...but it looks like you are some what committed...They make an adapter that bolts between the manifold and the turbo but that may cause fitment issues. The manifold is from an Ak Miller 240/300 draw through setup. It uses an IMPCO inline boost controller on the outlet of the compressor. 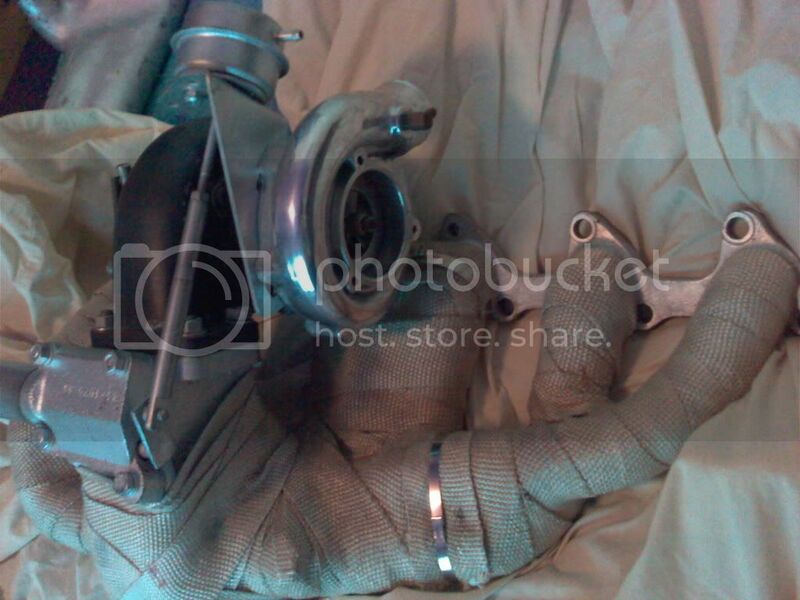 I want to use a wastegate instead. 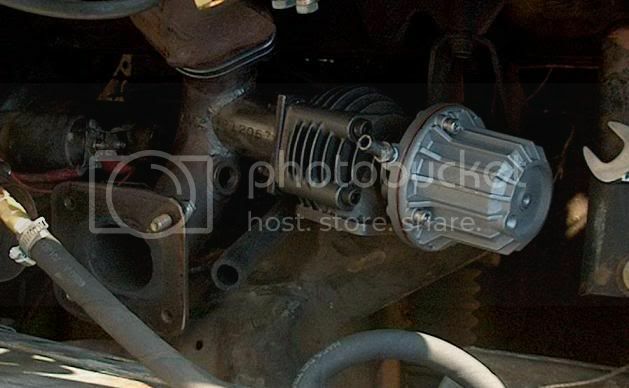 I looked at using an adapter, but it drops the turbo down too low which causes the compressor to hit the motor mount. 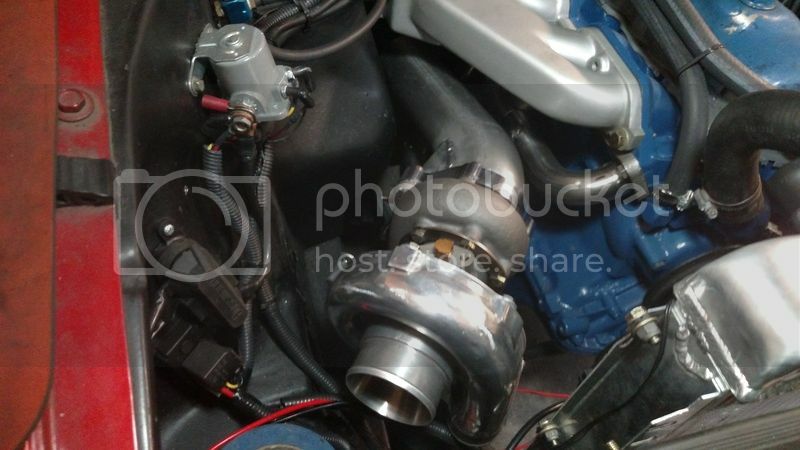 An alternative is to use a stock HD manifold and a J-bend with the wastegate attached right below the turbo, but I'd rather use the original manifold unless the new wastegate location won't work. What was the problem with the IMPCO inline boost controller on the outlet of the compressor? From what I've read it's restrictive even when fully open which in turns heats up the air mixture. Here's what the inside looks like: . The location isn't ideal, but I have seen similar locations in log manifolds work fine, even at high horsepower, as long as it flows enough to prevent creep. Right above the outlet flange would be best if you have enough area, but I've also seen the "sloppy mechanics" way of mounting on the turbine scroll work. Everything is realtive to what you can afford. Cost and also space are the final frontier. The TC 1 Controller is a savage lock off device that comes down hard with boost. 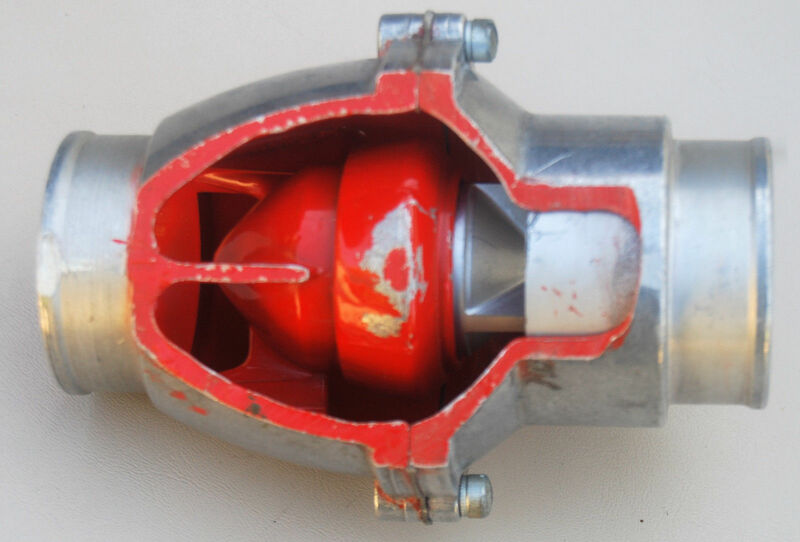 Generally, its a Propane engine part used for big stationary turbo engines on LP Gas or Natural Gas, and its use on a gasoline turbo engine is pretty nasty, but its safe and gets the job done. 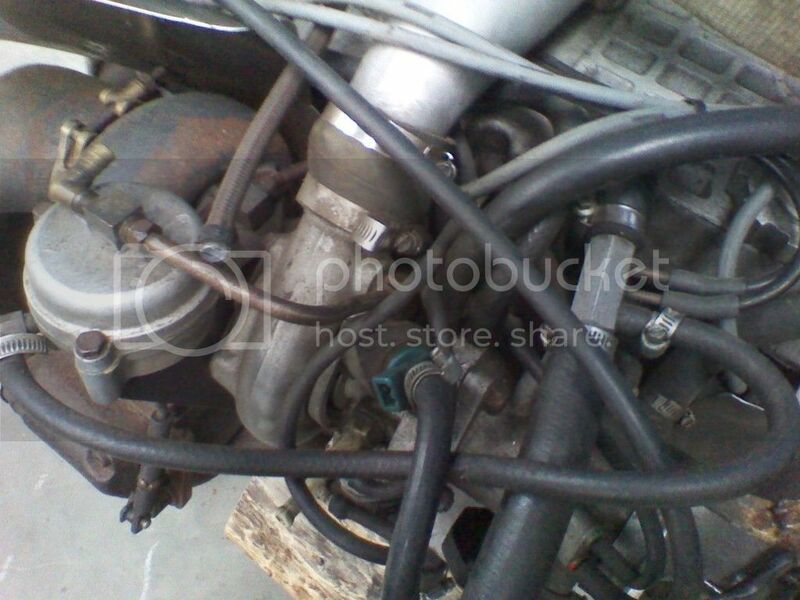 There are numerous other ways of making the exhaust manifold work. A proper extenal waste gate is always best if you can afford or calibrate it. Any kind, intehrated into the irin header, but preferably external. 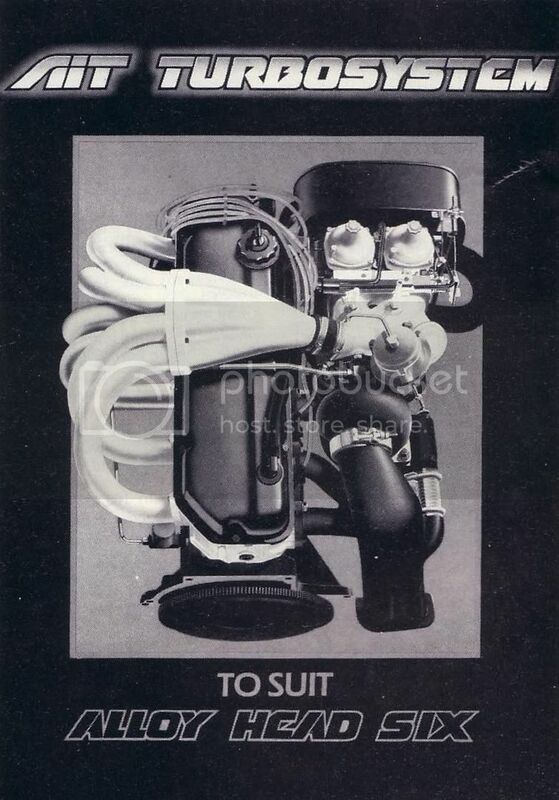 A split pulse in line six cylinder exhaust was used for the later carb and EFI turbo AIT 250 engines, as well as the Mike Vine turbos, but it was cast in ductile iron, and sometimes cracked in service. Lot of extra work for engines which also had a high mount starter and steering box right in the way. 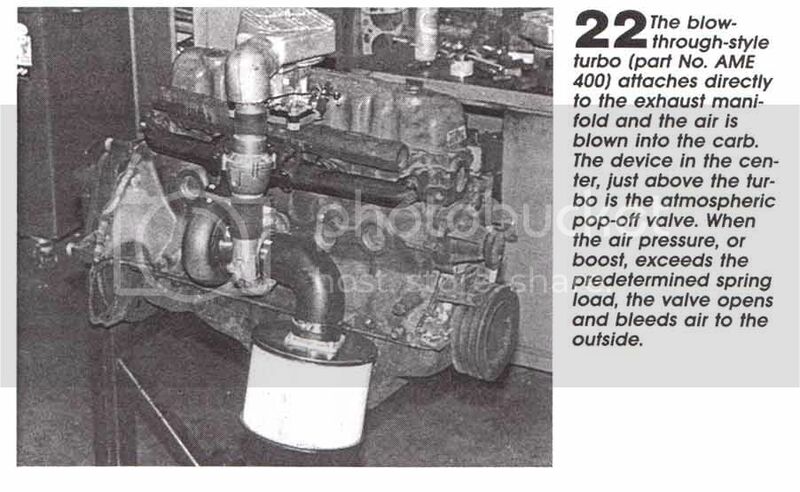 In Australia back in 1982, NormalAir Garret decided to give up on the turbo market, so a lot of over sized bigger AR turbos were around which made the aftermarket look into making what was around work. Essentially, the US company was pretty pi%%ed that yet again all its technology and expertise was being sent opff to the Japanese, like the Nissan Motor Company. To protect its intersests, it decided to target Airline companies, and stop being a conduit for having its technology and production cut into by other companies like IHI, Toyota and Mitsubishi, who decided to make there own turbos. Advanced Induction Technology went to a split pulse inducer to make a larger turbo do the work of a smaller one. 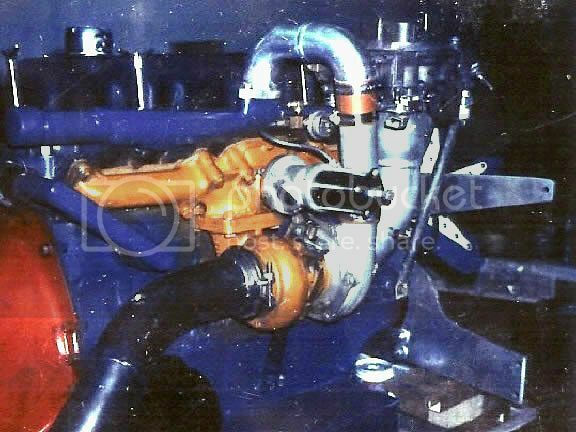 AIT's manager was ex NormalAir Garret, and he used the first of the US MicroTech controllers (auxillary non throttle body Upstream Fuel Injection using one or two CFi 5.0 EFi injectors upstream with a carbon sealed turbo. It was basically like the 7th injector Buick 231 Turbo T Type SEFI or GN/GNX aftermarket turbo systems, and later on, the verry same process used to boost the 200 plus mph Twin Turbo Callaway 'Vette). This was used to make the bigger AR T03 60 series turbo work in situations where eveyone else was saying "it risks surge, so down size the AR". The Esprit Turbo, Austin Metro Turbo, Datsun 910 "Bluebird" Turbo were 218, 95 and 150 hosepower engines with varing sizes of AR. 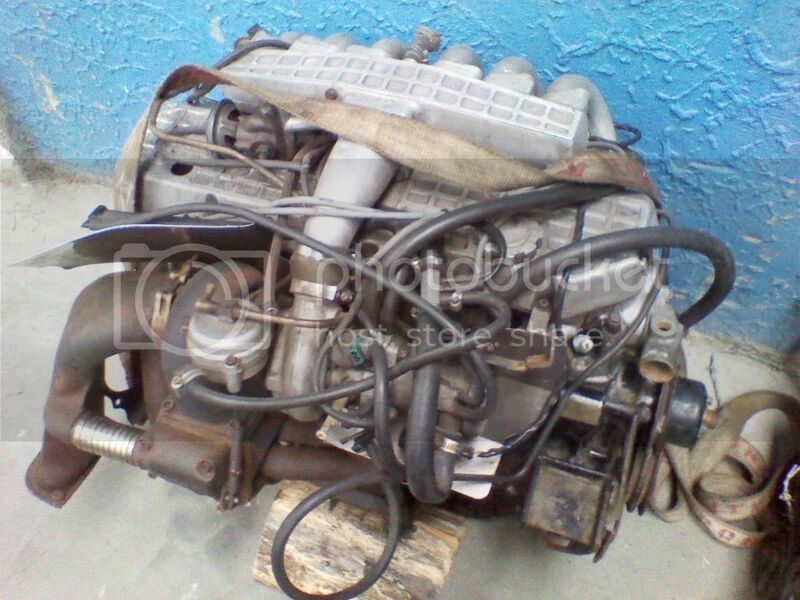 Essentially using Ford Carb 2.3 Turbo. Soon, thee Nissan Motor Company supplied the engine for the 1986-1988 Holden Commodore 3.0 RB 30E, and there was an optional 216 hp turbo version which used the same kind of T03, but the bigger AR one was also used first in the 1984 AIT 4.1 liter 250 cube Falcon 255 hp engine. A port EFI in line six with auxhillary Fuel injection, and an HO CFi Mustang 5.0 automatic Bosch injector upstream. 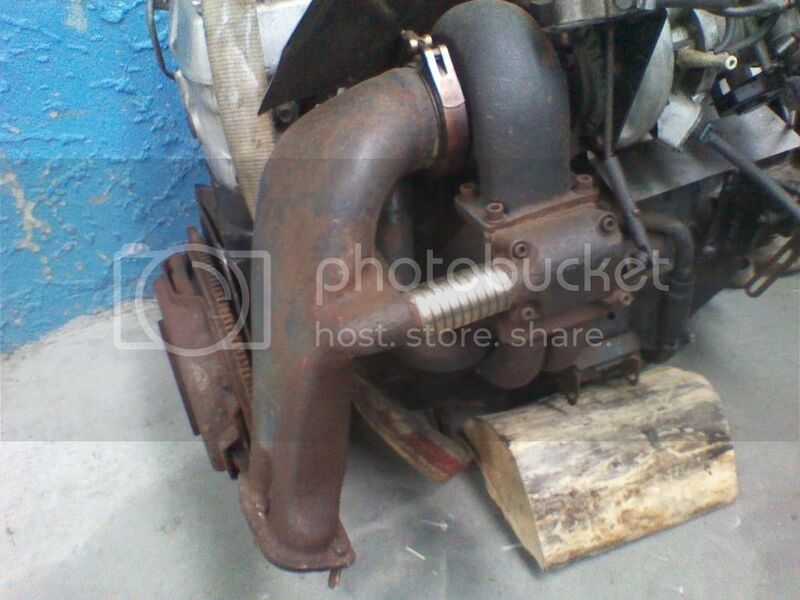 I think you should use the largest turbo you can get easily, and adjust the exhaust or induction so it comes on the turbo without surge, and that is best taken care of by improving efficency, not backing off or opting out of doing other simple modifications. Last edited by xctasy on Sat Sep 15, 2018 5:28 am, edited 1 time in total. Xctasy, thanks for the info. For the past few years my plan has been to use my almost 40 year old Ak Miller draw through turbo setup on my latest 300. Getting rid of the IMPCO boost controller and adding a wastegate has been one of my priorities. But after reading up on wastegate locations I've decided that trying to add a wastegate to the existing manifold is probably not going to work very well. And although the draw through setup worked well in years past, it did have a few issues, like flooding. 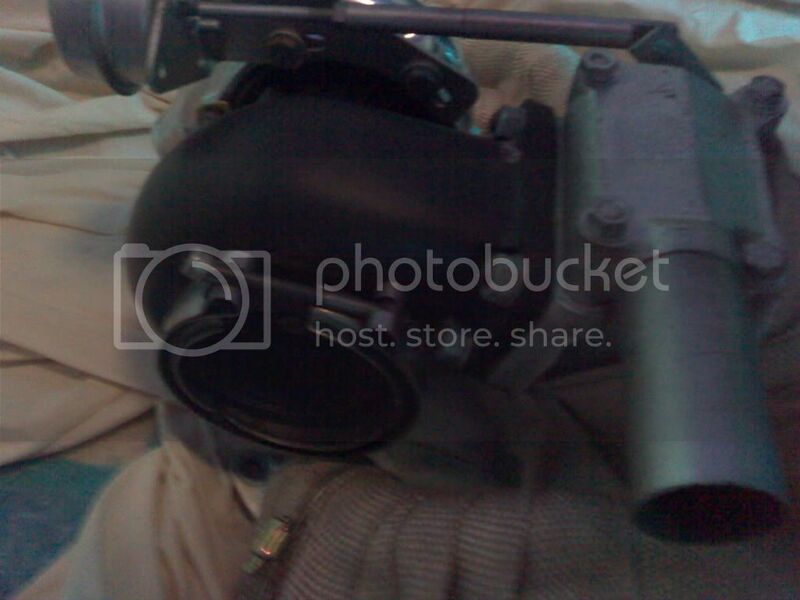 With the turbo down low the fuel had a tendency to pool in the compressor when first starting. Pump the gas a few too many times and you'd flood. Then you'd have to wait for the fuel to evaporate before trying again. So I've decided to stop trying to make the Ak setup work and instead I'm working on a blow through setup. J-bend out of a HD manifold with a wastegate connected to the J-bend. Offenhauser intake with a Holley Sniper EFI 4bbl. That's the current plan. I'm sure I'll have more questions. That's what I have in mind. 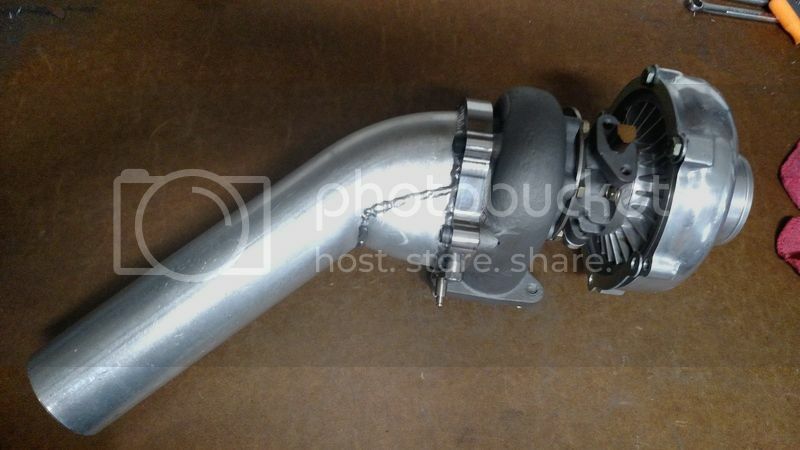 Attach the wastegate to the bottom of the J-bend. Would there be any performance benefit mounting it on the side of the J-bend verses the bottom? One would think that the bottom could disrupt flow smooth flow to the turbine, But it is the preferred location for '' waste gate priority'' placement to prevent boost creep...If the bottom gives you easy oil drain and other piping, I would go with it. Any members have any other thoughts on this ? So my thinking is with the AK system the turbo bolts right direct too the bottom of the manifold, this seams to be ideal. 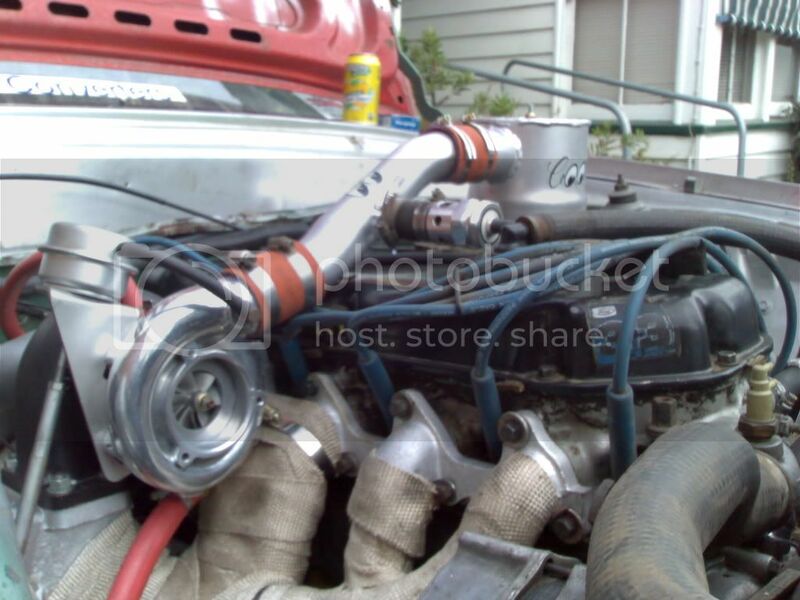 What about making a spacer plate to fit between the manifold and turbo to mount the blow off valve in? curts56 wrote: Attach the wastegate to the bottom of the J-bend. Would there be any performance benefit mounting it on the side of the J-bend verses the bottom? I'm also thinking the bottom would disrupt smooth flow to the turbine. 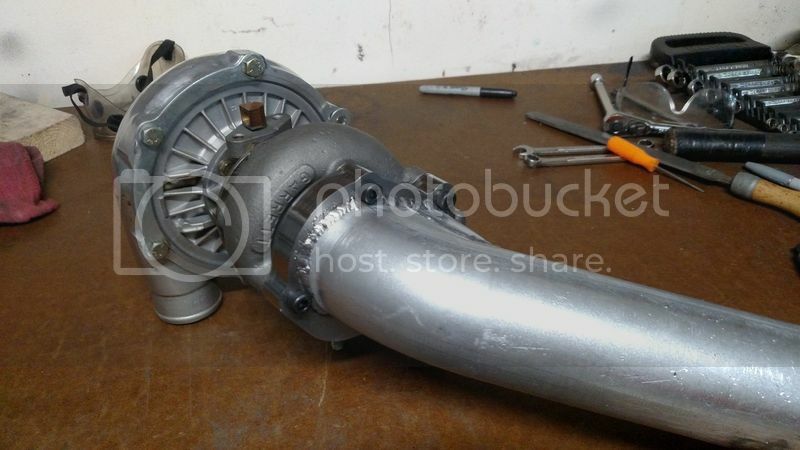 If the wastegate is large enough there shouldn't be boost creep with a side mount. What about making a spacer plate to fit between the manifold and turbo to mount the blow off valve in? I wish that would work. Unfortunately the compressor was already close to hitting the motor mount. Not enough space to move it down any further. Side mount shouldn't be a problem so I'll give that a try. I am ok with side mount...Looks like your waste gate is 38MM ...I would make the stub out inside diameter no smaller than the inside diameter of the waste gate flange. You will almost 100% get boost creep. You have 4 of the 6 cylinders rushing past the turbo port which inturn is going to keep giving the turbo exhaust pressure. How much boost creep you will get is unknown but you will most likely have some. thatblue_67stang wrote: You will almost 100% get boost creep. You have 4 of the 6 cylinders rushing past the turbo port which inturn is going to keep giving the turbo exhaust pressure. How much boost creep you will get is unknown but you will most likely have some. Not sure I understand , is this statement applied to pic in post # 1 or #10 ? In addition to all the other guys advice, drag-200stang's advice is right. turbosix had the same process. Lincs200 used the same idea. It was the only place I could put it and not hit anything.....not too bad for a few hours work. Nice to have a TIG welder. The postive corntrol of a wastgate is the very best, and it must be upstream of the exhaust, with all pulses from the six exhaust ports feeding the turbo. Anyhing else will not work well. 66Sprint6 wrote: Right after posting up about the latest tweaks the UPS guy dropped this sucker off. RJC's 3" downpipe flange with larger wastegate puck. Gonna be a bit of work to get it all sorted but I cant wait to get to it. Should free things up nicely behind the turbo and allow me to rid some of the small bottlenecks in the setup. 66Sprint6 wrote: Got some welding done today. Little cleanup to allow the bolts to clear and it was set. Looks awesome...so close! 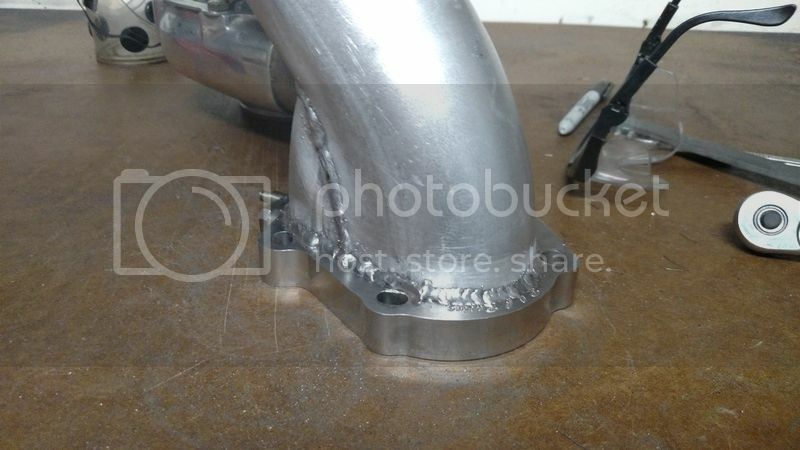 Gonna try to get the header to a buddy to TIG up for me and in the mean time I'll keep the downpipe going till it connects with the rest of the exhaust. I really appreciate everyone's input! 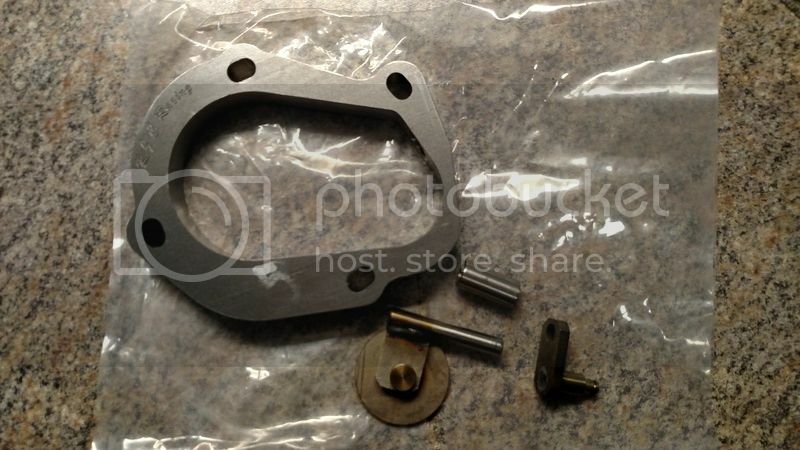 I'll post some photos as soon as I get time to weld on the wastegate flange.